So, my parents decided kinda last minute to come to Dallas for the long weekend. Mostly they came to get away before the final push and craziness of this last week before the wedding. But they also came for Mom to help Heather with cleaning in the new house (where Phillip has lived for the last 18 months) and packing up her apartment. So, that is how I spent my three day weekend - helping Heather pack for her honeymoon (she doesn't know where she is going ..... watch here after Saturday if you want details) and pack up some final things in her apartment. So, tomorrow another short week at work begins - then Thursday noon, it's off to Abilene! So, tonight I went sailing for the first time. It was a relatively short trip - but still, in a sailboat, on White Rock Lake. I liked it. I think I might want to do it again! 5 - traveling is definitely much, much easier! Ok, so there's not a whole lot that I can think of that make the list. But still, it is a list. Tomorrow is Friday -- and a three day holiday weekend. Yippee!! So, I'm back in Dallas finally. There apparently was some weather (around Dallas) that kept us from even loading the plane in Houston. Thankfully, it was only about an hour's delay. The ride was fairly calm and we made it back just fine. Tomorrow is back to work. Sorta back to my routine. But then there is the holiday weekend - and my sister's wedding is now just 10 days away!!! So, I thought I had plans tonight for dinner with my friends Wendy and Weldon. We even talked yesterday (as we both sat in airports) to confirm. But, she called about 4:45 today and let me know that she was sick. Something she ate over the weekend on her 10th anniversary trip to Saint Lucia had not agreed with her. So, when I called her back to let her know that I got her message, we just talked for about 30 minutes - I gave her the scoop on my life and she gave me hers. So, hopefully, sometime later this summer, she can come up to Dallas or I can come back to Houston for the weekend and we can shop and hang and really catch up. So, here I am, hanging out in a hotel room. Don't get me wrong - it's a really nice hotel room. But it is a hotel room - by myself. I've got magazines and the TV to keep me occupied, but it isn't quite the same as being with actual people who know and love me. So, now I am in Houston....in a hotel room...learning how to surf the internet, check email and blog via my TV. Crazy technology. I love it!!! So I was in Austin the beginning of last week for a conference. It was 18 CPE hours, but oh, so completely boring. I went through about 8 months of Journal of Accountancy magazines that had been stacking up on my desk at work, read the newspaper, did the crosswords and jumble puzzles...all in an attempt to stay awake listening to speakers. Then I flew back to Dallas and worked for two days. Thursday after work, my friend Kelly came to my house and we loaded up and headed to Saline Creek Farm (near the thriving metropolis of Grand Saline, TX) for a long weekend of scrapbooking, card making, and girl time with 16 other women from my church. It was so amazing. I've been wanting to go on one of the retreats for a while, but the scheduling just never worked out. This time it did, and it was great. We laughed, told stories, prayed, cried, and deepened relationships. All while scrapbooking! So, we got back to my house yesterday about 4:00 - unloaded a car full of supplies in the almost 100 degree heat ---- what is up with that??? I got cleaned up for dinner plans, then came home and started packing again. And now, here I am, in Houston for another conference. This one, hopefully, will be better than last week's. So, that is my excuse for not blogging the past week....just been too crazy!! It is now 12 days until my sister Heather's wedding. We're all counting down! I went to the tailor for a fitting for my dress this morning. I'll go back on Friday for a final fitting and then pick it up next Tues or Wed. Please be praying for my grandparents. My granddaddy (mom's daddy - almost 93) was in the hospital last week with severe stomach pain. While he was there, my grandmommy (mom's mom - 90) fell and gashed her hand and face and is literally black and blue all over. Please pray for smooth and speedy healing for both of them. And please pray for peace for my mom as she is dealing with that stress and the eternal last-minute to-do lists for the wedding. So, now that I've caught you all up on my life, I guess I better get to catching up on your blogs that I've been missing! TTFN! Well, my first time to "mobile blog" - although not in the form that most probably would - from their phone or web-enabled PDA. But it is the first time that I've traveled with a laptop and the intention of plugging into high-speed hotel internet access. Amazingly, it was so very easy. Plug and play. Gotta love technology. Now, off to watch the Survivor finale and work til bedtime. It is so needed. And there is almost always a shortage. So, please, make it part of your regular routine to give blood. The folks that work at the Baylor site of Carter Blood Care are so much fun. They poke fun at me and tease me and I dish it right back to them. It makes each experience an adventure for sure! Sadly, though, it is a small center. Which means that for them to have any career advancement, they must move on to another donor center. Will left a few months ago. I found out today that Alicia will be leaving at the end of May. And that the center coordinator, Mia, is contemplating moving on as well. These three folks are the ones that I know best. That know me and have fun with me when I come to donate. They remember what we talked about and what is going on in my life. Unfortunately, they aren't moving to a location that is even remotely convenient for me. Carter has lots of locations all over the metroplex, but the one downtown at Baylor is by far the most convenient. I'd probably follow them to another center if it was feasible. But, it's not. So, I guess I'll have to start breaking in some new phlebotomists and forming new bonds. I'll say it again: Please Donate Blood!!! Over the past several months, I've started a new Tuesday night routine. I eat dinner with my good friend Martha, and often her daughters Jennifer and Jill. Martha is a second mom to me. Several years ago, her husband Cullen was diagnosed with cancer and shortly thereafter she was diagnosed with breast cancer. My good friend Kelly and I took them dinner. But rather than just drop off the food, we ate dinner with them. It was the beginning of a wonderful friendship. It has been almost 2 years since Cullen lost his battle with cancer. Between that first dinner at their house and the time that Cullen died, I developed a great relationship with Martha. When I say she is a second mom to me, she really, really is. She's my local mom and a great friend. So, Tuesdays now have a sacred calendar item: Mexican food for dinner with Martha. We've varied locations (most recently we've enjoyed Casita Dominguez) and more often that not (at least recently), her daughters join us. It has been so great to get to know them better, too. It's kinda nice to have big sisters. Martha, I love you. I cherish our friendship and value your place in my life and my heart. Thanks so much for being another mother to me! You know, I so very often take my family completely for granted. I don't know why, I just think it is one of those little "forget your blessings" lies that Satan likes to weave into our lives. My sister and I volunteered for this incredibly huge project at our family reunion two years ago - to take over the Family Tree. Now, that may not sound so scary, but the family on my dad's side is really big. And our reunion includes families that trace their common root to my great-great-grandparents. When you think about their generation and the next, that generally meant lots of kids. 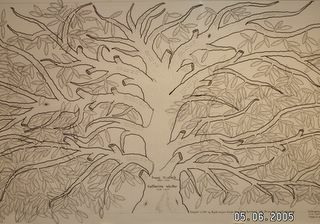 So, the Family Tree was designed and written down back in the 60s sometime and enlarged in the late 70s. 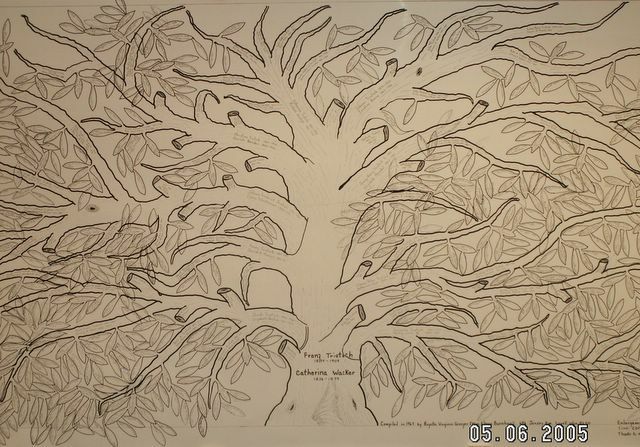 Since then, the Family Tree that I know has been on a roll of butcher paper 3 feet high by 5 or 6 feet wide. Well, as you can maybe see in the bottom half of the photo, the younger generations are marrying and having children and the tree is just getting too crowded. Plus, the lady that had been maintaining the information for the past 30+ years is getting older and just couldn't do it anymore. So, Heather and I volunteered to take on the project to redesign/reformat the tree and keep up with updates for the foreseeable future - which probably means most of the rest of our lives. Lots of time and thought went into how we could keep the tree in a large format - but we're not graphic designers. In a perfect world, we could print something straight out of Legacy. But while it is a great freeware program, their reporting capabilities aren't very creative. And we haven't yet figured out how to do a gargantuan "organizational chart" and get everyone in the right place. If there was any way to use the hand-drawn tree and leaves, but have typed information, that would be fantastic - but again, it is labor intensive. So, we're still thinking on that. For now, we decided to make a three ring binder - separated by each of the 9 major families that are my great-grandfather's siblings. After we spent quite a bit of time inputting all the information into Legacy, it was another huge undertaking in the spring of 2004 to actually create and type into PowerPoint all the family trees. But, the major work of creation is done. Now we are into maintenance. We have offered the Family Tree Notebooks for sale and, for the first printing, offered people the option of having it mailed. So, last summer we spent a Saturday printing, labeling, and shipping several (I can't remember how many) notebooks. Last night Heather came over, we made sure that we had all the information updates that people had sent us through the year entered into Legacy and then on the trees in PowerPoint. Today, we spent about 4 hours at my office to print the last binders that will be delivered at the reunion on June 11 (both of us are going to have to miss the reunion this year - Heather will be on her honeymoon and I'll be in a friend's wedding). The reunion is one of those love-hate things for me. While I love my part of this family, the reunion encompasses so many generations and levels of family I just don't know, that it is always a little awkward. So I kinda dread it, but then usually enjoy it. And now that Heather and I have such a major role in maintaining our information, it will really be glued to the calendar every year on the second Saturday in June. So, back to paragraph one - I don't want to take my family for granted. Neither my extended family, nor my immediate family. I want to remember and cherish my heritage and history and ensure that I am expressing love and gratitude to those who came before. For today, I will be thankful that my great-great-grandfather immigrated from Germany to start a new life in America. That he settled up near Denton, Texas and farmed the land. That he had children (lots), who had children (lots), who are all my relatives. Well, I must say I am pleasantly surprised with the service I received from DigitalEtailer. 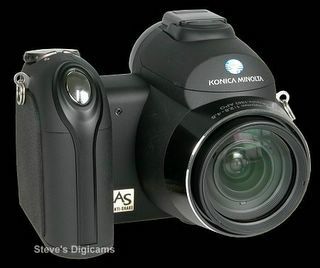 I ordered my new camera (see yesterday's post) on Tuesday evening. Received an email on Wednesday asking me to call their customer service regarding my recent order. They were just confirming my shipping method - ground (cheapest, you know) - and letting me know that it would be next Tuesday before I received my camera. No problem. Got the email confirmation that my camera shipped on Wednesday - FedEx tracking number included. So, Thursday I checked the shipping status. Surprise, surprise. They shipped it 2-Day air (which, if I had chosen that option, was an additional $10-15). So, this morning, before I really got settled in at work, our receptionist came into my office with a package! It's my camera!!! No time to play with it at work, but I will definitely have some fun this weekend. Konica Minolta DiMAGE Z5...now just waiting on FedEx to deliver my new toy! !